Update: Apple has confirmed that the White iPhone 4 will be released in Spring 2011. 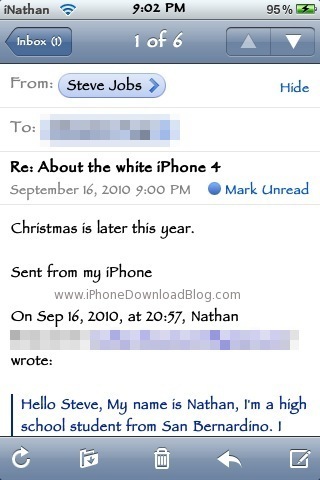 Just as the black iPhone 4 is becoming more steadily available, a supposed email exchange between Steve Jobs and a high schooler has provided a rough release date for the long awaited White iPhone 4 model. According to the unconfirmed exchange, the white iPhone 4 will ship near Christmas of this year. Hello Steve, My name is Nathan, I’m a high school student from San Bernardino. I also happen to be one of your biggest fan and a total Apple fanboy and proud to be. The biggest issue with the supposed email exchanges between Steve Jobs and, well, everyone, is that they are practically impossible to verify. This latest exchange was reported by the iPhone-centric iDB who points out that it’s always a possibility it’s a fake exchange. Releasing the White iPhone 4 near Christmas would certainly provide for a white christmas for the Apple fans that have been holding out until the white model is available. Update: Well as we mentioned, it’s always a possibility that these emails are fake, and iPhoneDownloadBlog.com came forward today stating that the email exchange was in fact a fake. The White iPhone 4 is expected to ship in Spring 2011.